Some of my friends were coming home for dinner and I wanted to make something quick and easy to serve as dessert. I decided to go for a barfi (which is a confectionery made primarily in the Indian subcontinent). The major advantage is that it can be made in large batches and freezes brilliantly for later storage. This time groundnuts caught my attention since I was going for something inspired by the traditional ‘chikki’. I was extremely pleased by how this barfi turned out. Roast the peanuts on a medium flame, stirring constantly for around 10-15 mins and switch off the flame. Once the peanuts cool down, remove and discard the skin. Crush the peanuts into fine powder using a mixer. Crush all the mentioned dry fruits into a fine powder using the mixer and keep aside. Now in a flat pan, heat the sugar and water till the sugar completely dissolves. Keep the flame low and stir continuously till no sugar granules are observed. At this stage, check the string consistency of the liquid. You want a two string consistency. Add saffron threads and stir the liquid for around one minute. Now add the finely crushed peanuts to this syrup and mix well for two minutes. Keep the flame low. Switch off the flame and add the ghee followed by the powdered dry fruits. Stir well to make a smooth mixture. Grease a flat tray with ghee on the base, the side, and the rims. 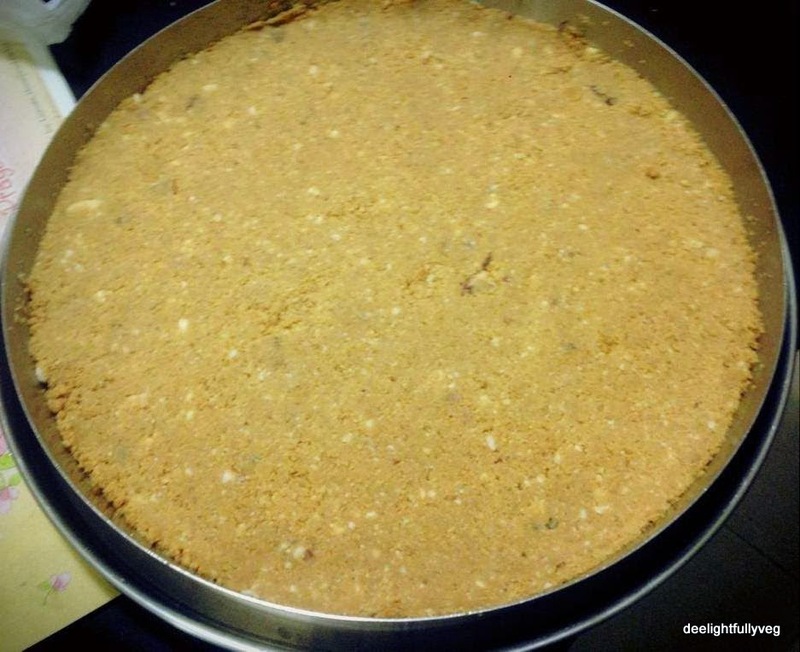 Spread the barfi mixture evenly on the greased tray and press down to form an even and compact layer. Let it cool and get firm for 6 hours. Once firm, cut it into small diamond pieces using a knife and scoop it out from the tray using a spatula. Do not let the peanuts burn. The dessert will carry a bitter, sooty taste. Keep the flame at medium and stir the peanuts often. I used brown sugar for making this barfi. If you use white sugar, reduce the quantity of sugar a bit since the latter is sweeter. If you add more raisins, reduce the amount of sugar. The size of the tray is critical in order to get a barfi of decent depth. Choose a smaller sized tray than the one shown in the picture for the quantity of peanuts mentioned. If the barfi crumbles after 6 hours while cutting, do not worry. Just apply some ghee on your palms and roll the barfi mixture into round shape and convert them to laddoos. They taste equally delicious. Cucumber has generally been a salad vegetable in diverse cuisines. It comes in varied sizes and varieties and the larger versions can be made into dishes that showcase the cucumber. I had a large cucumber lying around in my refrigerator – and I wanted to use it anything but a salad. 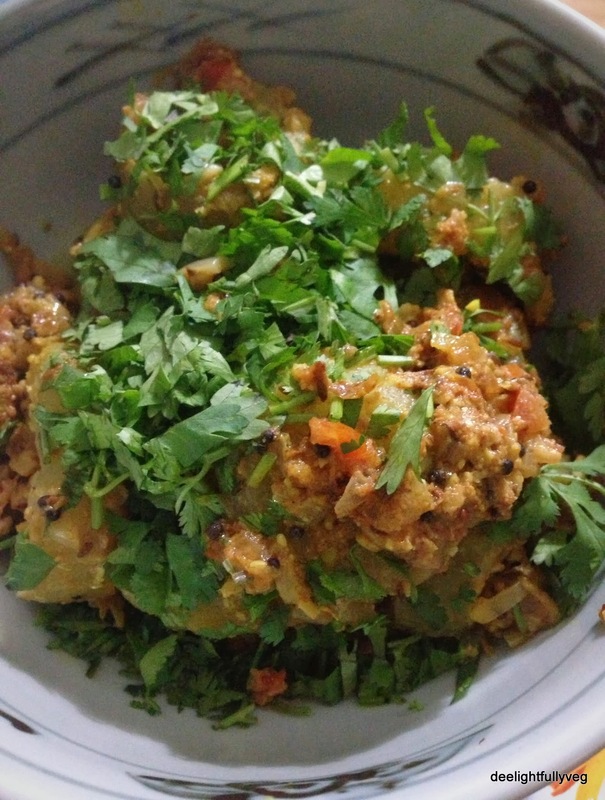 So I went ahead and made this stuffed cucumber gravy side dish which turned out to be extremely delicious and went perfectly with rotis or breads. You just have to try it to believe it. In a mixing bowl, take the ground peanuts, chopped onions and tomatoes, turmeric, ginger-garlic paste, garam masala powder, salt and mix them well. 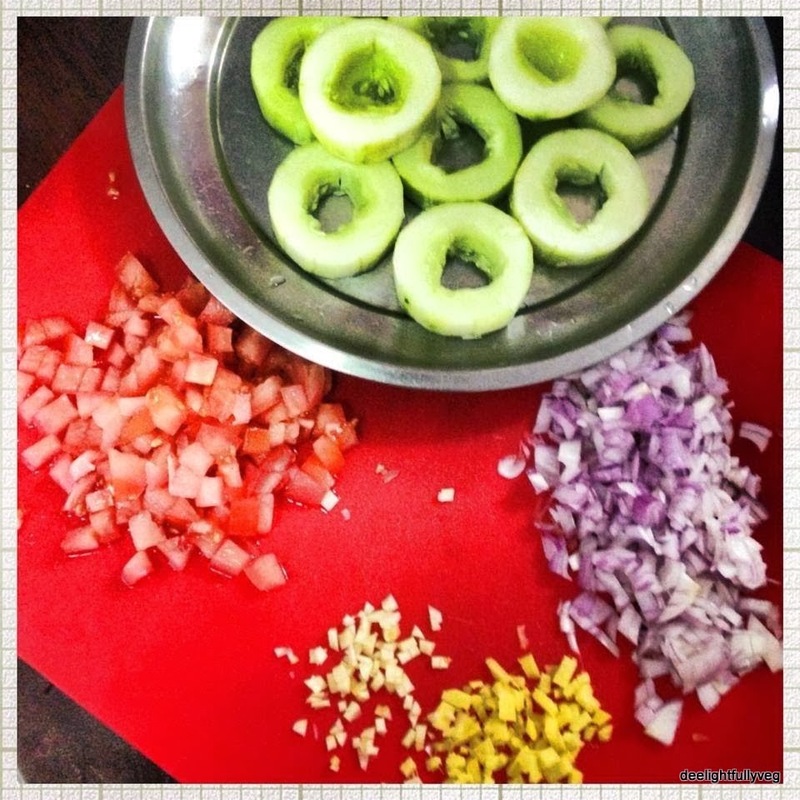 Fill this mixture in the center section of the scooped cucumbers and keep aside. Heat oil in a pan on a low flame. When it is warm, add the mustard seeds and wait till they splutter. Then add the cumin seeds. 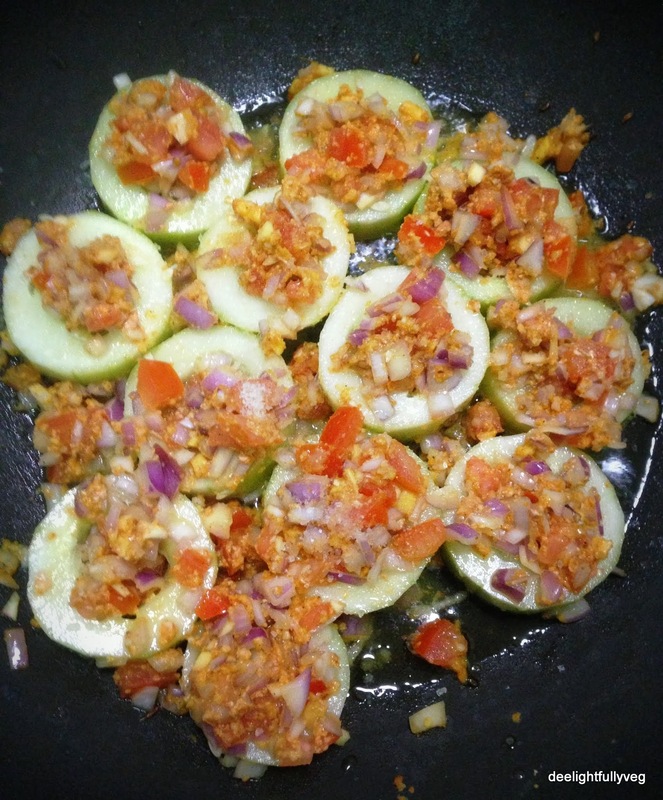 Add in the stuffed cucumbers and the remaining stuffing as shown in the picture. Cover and cook on a low flame till they become soft. Sprinkle some water at this stage to help steam the vegetables. After 5 minutes, flip the cucumber pieces so that the other side also gets cooked. If you feel that the stuffing is burning a bit at this stage, sprinkle some more water. Add chopped coriander at the end and serve hot with rotis. As cucumbers cook quickly, ensure to cook on low flame with covered lid. If you require more gravy, increase the quantity of both onions and tomatoes by 1. 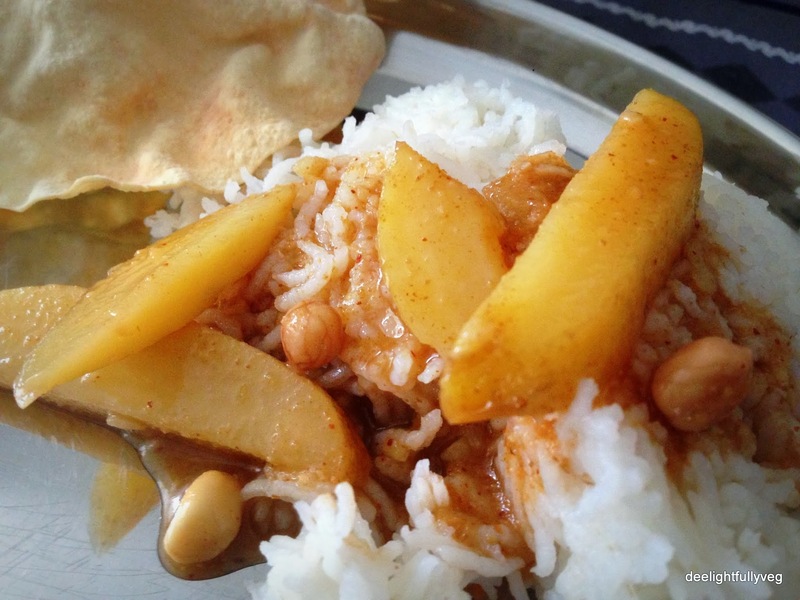 The humble potato is a highly versatile veggie that works equally well with rice and rotis. All that’s needed is the idea to make a dry sabzi or a gravy. I decided to try an interesting combination of potatoes and peanuts in a mildly spicy gravy which goes perfectly with rice. Soak peanuts in hot water and keep them aside till they swell [around 30 mins]. Drain and set aside. Soak tamarind in warm water and extract the juice. Peel and chop the potatoes into crescents. Peel and crush the ginger. For the spice paste: Heat a drop of oil in a pan and roast coriander seeds, Bengal gram dal, fenugreek seeds and red chillies together till they start changing colour. Then add cumin seeds and roast till it gives a pleasant aroma. Finally add asafoetida and roast for a few seconds. Switch off the flame. Let this mixture cool for about 15 minutes. Finally, grind these roasted ingredients into a smooth powder in a mixer. Then add the grated coconut along with a little water to this spice mixture and grind once again for around 5 seconds. Now heat oil in a vessel, add cumin and mustard seeds and let them splutter. Add the potatoes and peanuts, along with the extracted tamarind juice to the vessel. Add turmeric, salt and crushed ginger at this stage. Cover the vegetables and let them cook in low flame for around 10 minutes. When the vegetables become tender, add the ground spice paste and cook for another 5 minutes. Potatoes take a bit of time to cook – keep monitoring and stirring. Add water if needed. Garnish with curry leaves and serve hot along with rice or rotis and roasted / fried papad. Monitor the water level in the gravy while cooking. Add water and manage the heat to get the consistency of your choice. Adjust the chilli and coconut levels to your taste. You can make this dish richer or spicier depending on the ratio of these ingredients.